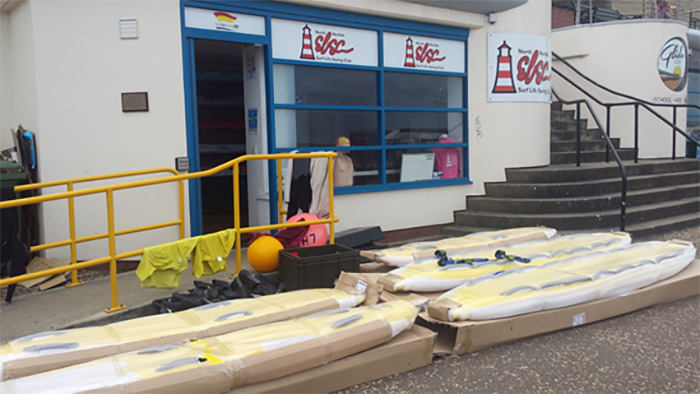 A grant made by the Sheringham Shoal Community Fund earlier this year has enabled the North Norfolk Surf Life Saving Club [www.nnslsc.org.uk] in Cromer to pay for volunteer training and purchase a range of new equipment which will enable the Club to expand and train its junior membership. The grant will enable 10 volunteers to take part in Level 1 and 2 training courses , and the newly arrived equipment includes junior rescue boards, training wetsuits, rescue tubes and CPR trainer packs. NNSLSC is a Community Amateur Sports Club; it was formed in 2008 to establish a focal point for volunteers in Norfolk to train and improve their life saving skills whilst enjoying the stunning Norfolk coastline. It currently trains 3 junior age groups from 7-16 years. Sheringham Shoal Community Find supports projects that make a difference in North Norfolk, tackling issues including climate change, sustainable communities, marine environment / safety, renewable energy and education / employment. The 317MW Sheringham Shoal Offshore Wind Farm, which is operated by Statoil, is situated between 9-17 miles off the coast of North Norfolk.